ARIANE has been designing, manufacturing and selling ladies’ and men’s hats since 1991. It is a family-owned company. ARIANE has operated a retail boutique since 1999. At her current location on Melrose Avenue, ARIANE offers ladies clothing, jewelry and accessories, as well as hats for women and men. Azita Ariane Azarpira was born in Iran and spent most of her formative years in Tehran. From an early age, she was fascinated with fashion design. With no formal training, she began in junior high school to design her own clothes. Her fashion illustrations impressed her art teachers throughout her junior high and high school years. At the age of 15, she was asked to design the costumes for a dance sequence for a production that was being presented by the students at her school. Ariane not only designed the costumes for the ten dancers, she selected the materials for the costumes and choreographed the dance. Although she never lost interest in design, Ariane chose a different path for her university-level studies. She went to London where, in 1975, she attained a BA in English Literature. In 1976, Ariane moved to the United States and has lived there ever since. In the US, she worked toward and received an MA in Early Childhood Education. A little later she was awarded another post graduate degree - an ED S in Teenage Counseling. Armed with these credentials Ariane won a position with an organization which operates group homes for emotionally-handicapped teenagers. After ten stressful, but highly rewarding, years, however, Ariane decided that a career change was in order. Ariane still had a strong interest in fashion design. In fact, during particularly trying times with her teenagers, she would ease the strain by sketching high-fashion clothing accessories. Ariane entered the Otis Parsons School of Design to study fashion design, specializing in the art of millinery. In 1991, after graduating from Parsons, Ariane formed a business to manufacture and wholesale ladies hats. She sold nationally and internationally and was represented in trade shows worldwide. In 1999, to make full-time use of her design talents, she opened a boutique in Beverly Hills; she named it ARIANE. In the year 2000, she welcomed her son, Amin, into the business. 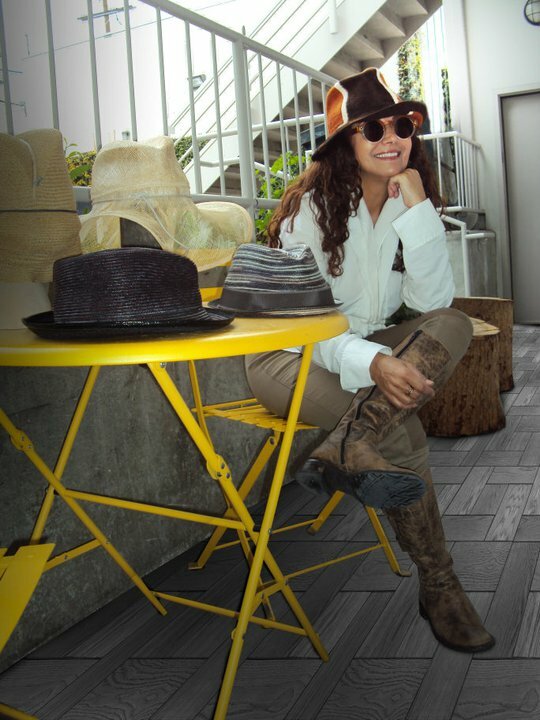 Together, they design and make, for women and men, custom hats, travel hats and hats for sun protection. They, also, design hats for special occasions and places, e.g., the Kentucky Derby, Ascot, Delmar and the Melbourne Cup. ARIANE sells regularly to national politicians; models; rock, pop and soul singers; writers; actors. Some of the prominent persons to whom she has sold: Kim Kardashian, Andy Garcia, Paris Hilton, Maxine Waters, Beyonce, Mariah Carey, Missy Eliot, Ashton Kutcher, Patty LaBelle , Tommy Lee, Ann Margaret, Ricky Martin, Victoria Rowell, George Lopez, Joe Pantoliano, Kelly Osborne, Fergie, Christina Hendricks and many others.